Holy crap, more releases?! I’m not complaining! So… *ahem* Here’s our surprise joint project with KiteSeekers. Regardless of the other subs out there, this series is just too funny to pass up. Same deal with Milky Holmes: we’ll try to get this out weekly, but expect a few days late, as our new capper Black_Ops can only snag the Monday night broadcast, not the first one that airs on Saturdays. Also, as the OP/ED song lyrics were quite difficult to make out, we may do v2’s once the official CDs come out, or just on the final episode – depending on how our schedules go. On that note, the translator for this show will be overseas on vacation(ish) between mid February and mid March, so expect releases even later during those weeks. 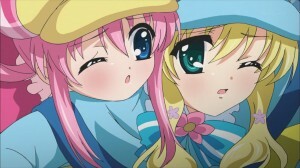 Tantei Opera Milky Holmes 3 out! Les Miserables Shoujo Cosette 38 released! Not a bad show so far. It definitely has a different kind of art style from other anime. Do a v2 for epi 1 & 2 using the official lyrics for the OP and ED. We might later for the batch. Wow it’s been like two weeks! Are you ever going to update past episode 3? I’m dying here. JK JK Nice job Wasurenai. I await episode 4. I hope someday there will be an uncensored version. I think the censored one is unwatchable the way it is censored. I gave up on it after episode 3. But not due to lack of liking the show. Next post Les Miserables Shoujo Cosette 34 released! Previous post Les Miserables Shoujo Cosette 33 released!